Learning Chinese is a journey spring-loaded with many twists and turns. There’s pinyin, hanzi, radicals and so much more behind this wonder of a language. However, one highlight I am going to introduce to you today is the concept of Chinese idioms. Idioms are tasteful expressions, that are used to convey a literal message figuratively, and they can be quite the head turner when used correctly. In Chinese, many of the idioms are arranged in sequences of 4 hanzi characters. This structure allows for Chinese idioms to deliver a powerful impact while staying concise. And what’s not to like about sounding like a 21st Confucius? Idioms aren’t used like everyday run of the mill adjectives. Culturally, idioms are widely recognized, however they are used only when the perfect opportunity arises. Have you ever told a funny joke about a funeral, at the wrong time…at the funeral? It won’t end well. Nonetheless, idioms are a great way to express your cultural comprehension and intellectual wit. Here are 7 Chinese idioms that are sure to keep the attention spans of your conversation partners. Okay, you’re going to laugh at this one. The characters read “protect, mouth, like, bottle”. Imagine a bottle cap that just won’t budge, even after you’ve tried everything there is in the book. Hot water, can openers, wine cork removers – you’re not going to get a single word out of this bottle. Swish that image in your mind a little bit, and with a little creative power you get “To be tight-lipped”. As a free spirit, this one is honestly my favorite. It simply screams, “LIBERTY” from the top of its lungs. Reading from left to right the meanings are as follows Oneself, Reason, Oneself, Now. This idiom’s equivalent in English would be “To be carefree”, and it really speaks for itself. Be freeeeeeee! This is a common expression of frustration, but no matter the language it’s always meant to be snarky way of telling somebody off. This idiom is a bit ominous, but nonetheless, it’s pretty darn cool. The characters are “night”, “deep”, “people”, quiet”. It translates as “In the dead of night.” If you’re feeling super creative you can even make it out to be “deafening darkness”. Chinese idioms can make your experience with the language a lot more insightful. Besides sounding clever and sharp-tongued, you’ll begin to notice an increasing number of recurring patterns throughout the written and the language. However, if you want to really get a good grasp of Chinese, then you’ll need absorb a lot of good content. 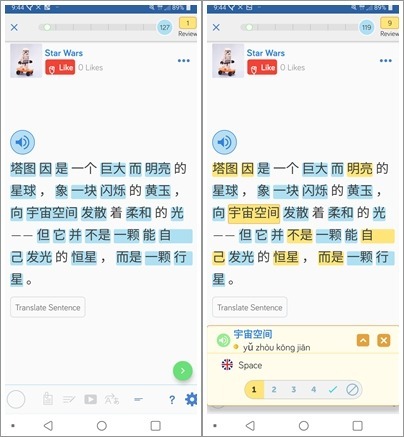 LingQ has thousands of hours of content, including stories and short dialogues in Chinese (Mandarin and Cantonese). Best of all, if you’re unable to find content that suites you, you can import content from the web. Things like podcasts, YouTube videos, and much more! Listen, read, and watch your favorite Chinese content in one platform. You can also study anytime, anywhere thanks to LingQ’s mobile app. By reading compelling content on a daily basis, your Chinese language skills will grow and you’ll be on the right track to becoming conversational (or even fluent). Good luck! Kiandro has a B.A in Asian Studies and enjoys studying foreign languages. He’s proficient in Japanese and currently has Chinese, Spanish, Swahili and Esperanto on his plate. YUMMMM!